Recently, I've been doing a lot of paintings of interesting things in places that are not my home county. So today I'm sharing a little oil I did of one of the very typical scenes we see in Lancaster County. I call it Amish Barn in Sun and Shadow. Our county is the one that the Amish first settled in in the US (arriving around 1730) from southern Germany and parts of Switzerland. The Amish still live in our part of Pennsylvania in sizable numbers, and like their forefathers, farming -- including dairy farming -- is still a major way they earn their livings. The old order Amish don't use electricity (for the most part), so their barns still are designed to easily house the cows and the hay, etc. to feed them without needing to have a lot of fancy (electrical) equipment to hoist the hay into the hay lofts. Thus, an "Amish barn" is distinguished partly by the fact that it is either built into a hill, or a hill is simulated by creating on one side of the barn a ramp on which the hay can be brought in for the winter. This barn has one of the simulated hill entrances. Like with other Amish barns, the far side of the barn is on ground level to make it easy for the farmers to bring their cows and horses in. Notice that this barn also has another typical "Lancaster County" feature: silos to ferment and preserve corn for cows to eat in the winter months. Because the Amish don't use big farm equipment, the average size of a Lancaster farm is small (only around 86 acres), so when you have a long view of the countryside anywhere in our county, you will see scores of silos and Amish barns. 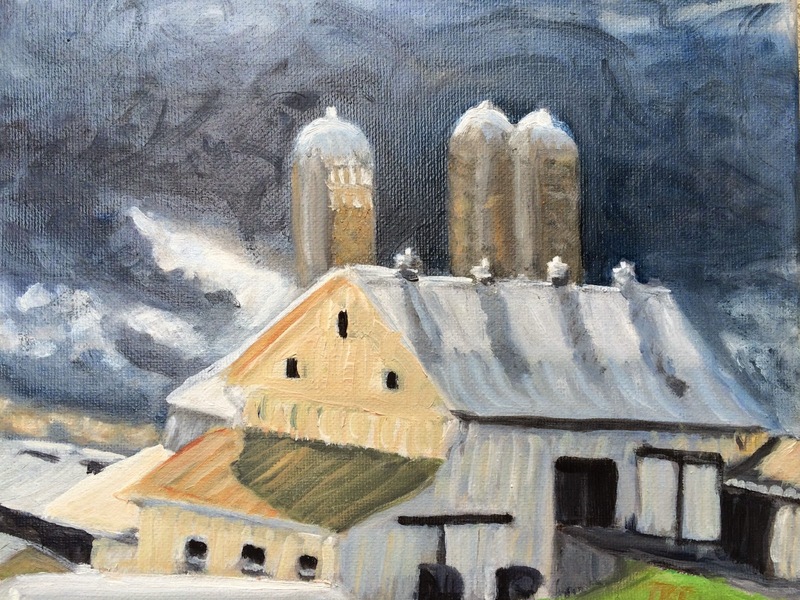 I painted this barn because I love the contrast of warms and cools as the late day sun shines on the barn that is silhouetted agains the steel gray of storm clouds. Hope you enjoy it. As with all others of my small works, I'm posting it for sale on my Daily Paintworks Gallery site. So, if you are interested in this little oil, check out the auction there.